On November 13, the European Union adopted an embargo to Venezuela on all arms and on related material that might be used for internal repression. It is meant to underline the EU policy: “The EU calls upon the government to urgently restore democratic legitimacy, including through free and fair elections, and on the opposition to continue engaging in a united manner towards a negotiated solution to the current tensions, in the interest of the country. The EU reiterates its full support to regional and international efforts to find a lasting solution to the crisis." The Maduro regime has lost its legitimacy because of its corruption, violence, arrogance and incompetence. The opposition against it runs by now from far left to extreme right. An arms embargo is a pressure mechanism targeting those in power and not the population. The EU states: “These measures were designed not to harm the Venezuelan population whose plight the EU wishes to alleviate.” It is indeed the Venezuelan population which has to solve the internal socio political chaos, without interference. So far the Maduro regime is using mostly batons, small arms and light armoured vehicles for its repressive actions. In the period 2014-2015 EU countries provided licenses for imaging equipment, light weapons and artillery, substantial aircraft exports, vehicles, tanks and armour (see table below). Not all licenses led to actual exports. But these licenses show that exports which can be used in human rights violations were considered appropriate by European countries such as Austria, Belgium, the Czech Republic, France, Italy, Spain and the UK. The UK Independent pointed at the export of crowd control equipment for use by law enforcement agencies in 2016. An overview of EU military exports to Venezuela based on the SIPRI database on arms transfers shows that Spain is by far the most important source for Venezuelan weapons. Madrid sold naval vessels valued at over one billion since 2001. For the Netherlands, the number two European supplier to the Venezuelan armed forces, reported sales are on naval fire control equipment of Thales Netherlands. Officially the Netherlands stopped arms sales to the country. However export continues, because these are after sales to earlier established exports. 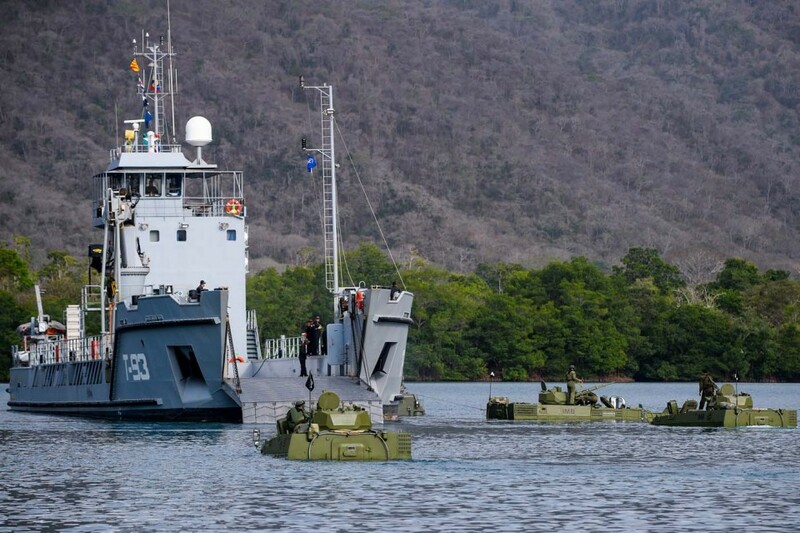 Recently the Netherlands exported armed patrol vessels to Venezuela. The deliverances of these Dutch ships was debated in Parliament a year ago. In this debate the Minister of Foreign Affairs explained that the Damen ships were not reported in the list of military exports, because they are civilian. But a publication of Stop Wapenhandel pointed at a naval military magazine: “In this case however, according to this month’s issue of Sea Power, the Stan Patrol 4207 ships will be equipped with one 20mm canon, two 12.7mm and two 7.62mm machine guns. The Stan Patrol 2606 craft will be equipped with three 12.7mm and three 7.62 machine guns and one automatic grenade launcher each.” As this equipment is added after export, it gives the European exporter space to use a broad bandwidth for the definition of 'civil' and the embargo has thus no effect on these sales seen the aforementioned exceptions. Economic benefits seems to be the decisive factor in this export. Damen and Thales are the cornerstones of the Dutch defence industrial base. The Los Frailes (T-91), Los Testigos (T-92) en Los Roques (T-93) and Los Monjes (T-94) are part of the navy of Venezuela and add to the logistics, operations and armed tasks. A second order for four ships of the same class was placed in 2015 at Damen's Vietnamese based Halong Shipbuilding Company. Pictures make clear they have a military task and may also be used for internal repression e.g. by bringing armoured vehicles to the place the government needs them.